Governing your ITSM program is a daunting challenge in today’s complex IT environment. It becomes even more challenging when you don’t control all the moving parts. IT organizations are increasingly turning to Software as a Service (Saas), Infrastructure as a Service (IaaS) and a myriad of other cloud-based options in order to deliver services to the business. While you may have outsourced the delivery of these services to the cloud, the IT organization still is responsible for overall service delivery. So how do you get your arms around something so “ nebulous “ as the Cloud? 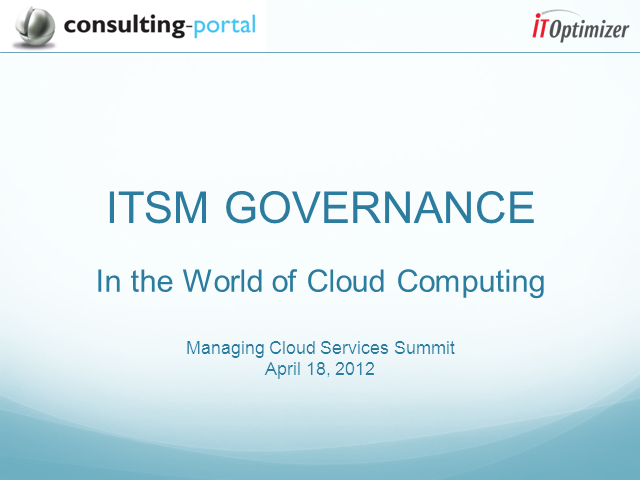 Join David Mainville in an interactive discussion on how to extend ITSM governance to the “Cloud”. • What is ITSM Governance and why is it critical to Service Delivery? • What are the Service Delivery challenges presented by today’s Cloud Based offerings? • What services should I consider moving to the Cloud / how do I choose?